On December 10, 2010, President Potter said “Accreditors noted the deficiency of the curriculum and, for two years, no progress was made.” That’s an odd statement to make considering the fact that AABI, the accrediting team, didn’t audit the SCSU Aviation Department until July, 2009. That means they didn’t examine SCSU’s curriculum until that time. “SCSU doesn’t own a single plane; it’s one thing that makes this aviation program really unique. We started out as an Aero club, it’s a student-run organization that owns the airplanes. That’s how our department started, with enthusiastic people that wanted to learn to fly and it just grew from there,” said Jessica Miller, member of the Aviation Ambassadors. Actually, the airplanes aren’t the most expensive equipment Aviation students use. The flight simulators might be. Again, SCSU didn’t pay for the simulators. Student fees paid for about 90% of the cost of the newest simulator. The new simulator cost approximately $100,000. Student fees paid for over 90% of that expense. Likewise, SCSU doesn’t pay for the flight time flight students buy. That’s paid for by the students, too. In other words, the only expense that SCSU pays for are the professors and staff of the Aviation Department. During the 2010-2011 school year, the total amount spent on 4 fulltime professors and 4 adjunct professors was $275,499. Chancellor Rosenstone, if meeting the changing workforce needs are as important as you suggest they are, why haven’t you reversed President Potter’s foolish decision to eliminate SCSU’s Aviation Department? Boeing is forecasting the need for hundreds of thousands of airline pilots in the Pacific Rim alone. That’s before considering the tens of thousands of airline pilots that will be needed for domestic flights over the next 15 years. The bottom line is straightforward. President Potter isn’t being honest about the curriculum or the cost of the Aviation Department. Chancellor Rosenstone isn’t being honest about putting a high priority on meeting the workforce challenges of the near future and the now. The time for integrity is now. Proper prioritizing of SCSU’s resources should’ve happened ages ago. Unfortunately, that hasn’t happened. It isn’t a stretch to think it won’t happen during a Potter administration. Thanks to President Potter’s decision, alot of students will be forced to get their flight degrees from more expensive universities. It’s hard to think that Minnesotans hired him to make that type of decision. MS. LAHAMMER: Why isn’t it possible? Everyone’s saying ‘It’s a new technology.’ They’re saying it’s flashy and new. Shouldn’t that attract new people? REP. DRAZKOWSKI: All of the 2,500 sites across Minnesota that would be doing this, Mary, would have to increase by a ticket per minute, 365 days a year, 17 hours per day. An additional ticket per minute above what they’re currently doing now. That’s hard to believe. MS. LAHAMMER: But the proponents of this say their estimates are conservative. They say they’re not even close to aggressive.You don’t buy it? REP. DRAZKOWSKI: All that’s interesting. The bill that existed last year was actually budget neutral, the charitable gaming bill. Now that’s a night and day difference between that bill and this bill in terms of what it’s expected to produce. I don’t remember the numbers that were projected in terms of revenue in that bill but they were just a small fraction of what they’re projecting in this one. Rep. Drazkowski deserves praise for dragging the argument back from the theoretical into reality. Comparing apples to apples is the last thing the pro-Vikings stadium lobbyists want at this point. They want the debate focused on who’s the biggest Vikings fans. 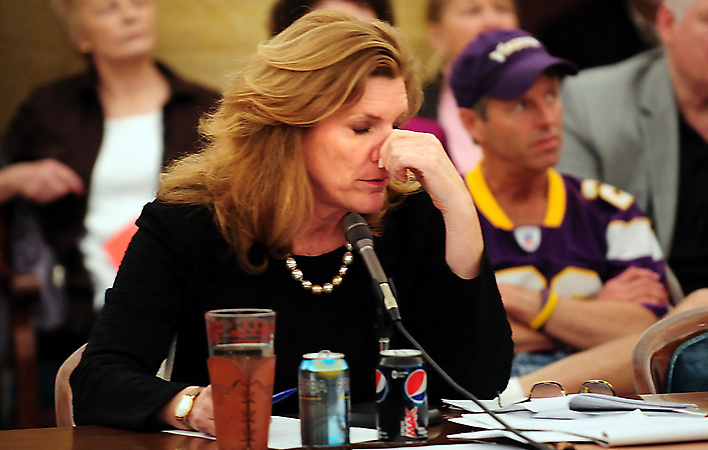 The last thing the pro-Vikings stadium lobbyists want is a serious policy-based conversation. It isn’t a stretch to think that pro-Vikings stadium lobbyists are as frightened of serious policy-based conversations as vampires hate wooden stakes. REP. DRAZKOWSKI: There’s some fundamental problems with the financing structure behind it. That sentence should frighten every taxpayer because of its potential impact on Minnesota’s general fund budget. It’s one thing to get the bonding wrong on a $20,000 project. You might not even get hurt if you get the bonding wrong on a $200,000 bonding project. This isn’t about who’s the biggest Vikings fan. It’s about fiscal sanity. It’s about the legislature being the taxpayers’ watchdog. At this point, there are some who are intent on being the taxpayers’ watchdog. There are others who are intent on proving that they’re great Vikings fans. Minnesota can’t afford to get this wrong. No matter what anyone may have predicted, Cravaack has been spending far more than a day a week back home in Minnesota, working with constituents and staying in touch with their needs and challenges. In 2011, he spent 164 days in Minnesota’s 8th District, or more than three days a week, according to the pages of the congressman’s official calendar and schedule, access to which was granted exclusively to the News Tribune Opinion page. Cravaack spent another 139 “voting days” in Washington, D.C., and 19 other days working at various spots around the world. He spent only 11 days in 2011 in New Hampshire, including Dec. 23 and Christmas Eve. His family regularly spends time with him in Minnesota, too, he said in an interview. This won’t stop the DFL’s mantra. They’re too invested in it. They’ve repeatedly proven that statistics and proof are irrelevant to them, especially during election years. There’s good reason why the DFL doesn’t want to deal with reality. Reality makes them look tiny in terms of accomplishments. During the last 5 years of Rep. Oberstar’s legislative career, he didn’t lift a finger to make PolyMet a reality. During his first month in office, Rep. Chip Cravaack made a point of getting PolyMet together with the EPA and the MPCA on a quarterly basis to create a path to make PolyMet a reality. Rep. Cravaack did this because the Iron Range was hurting economically. He knew that pork projects weren’t the long-term fix that the Range needed. Chip knew that something substantive was needed. That’s why he made PolyMet a priority. The last thing the DFL wants to do is admit the truth about Rep. Cravaack’s accomplisments. If the DFL talked about Chip’s a) votes for reforming Medicare, b) public safety initiatives like insisting on cargo pilot rest rules and c) vote to restrain the growth of the federal budget, they wouldn’t have a chance this November. Follow this link to read more on the DFL’s spin operation. Back in the 1970’s, a coach who had to face Woody Hayes’ Ohio State football team was asked to describe the Ohio State offense. The coach simply said “3 yards and a cloud of dust.” The description was apt. It also fit most Big 10 teams at the time. Today marks 3 years since the Democratic Senate passed a budget. It isn’t something for the history books like Watergate. Still, it’s a major stain against the Democrats. Senate Majority Leader Harry Reid appears to believe it is not necessary for the Senate to fulfill its legal responsibility by debating and passing a budget to account for $3.8 trillion in federal spending next fiscal year, $15.6 trillion of debt and, according to figures produced by the Senate Budget Committee Republican staff, more than $65 trillion in additional unfunded liabilities. To provide some perspective to these incomprehensible numbers, the total net private asset base, that is, the net value of all household assets, small business assets, and large business assets, of the United States is $82 trillion, according to figures from the Federal Reserve Flow of Funds Account from March 8, 2012. Even worse, President Barack Obama and his administration seem to view budgeting as just one more political maneuver. His efforts have been so completely unserious that the President’s 2012 budget was rejected by a vote of 97-0 in the Senate. And three weeks ago, when Rep. Mick Mulvaney, R-South Carolina, sponsored a budget proposal based on Obama’s 2013 budget plan, it lost in the House by a vote of 414-0. While it’s true that Democrats voted against President Obama’s budget, it’s important to note that they didn’t put their own budget together, which is required by U.S. law. The reality is that the vast majority of Democrats agree with President Obama’s budget. It’s just that they didn’t want to admit it in a vote. This is an admission that their policies play well with #OWS fringers but don’t play well with thoughtful adults. Democrats can’t win without the fringers but voting with them in high profile situations will get them defeated, too. At the heart of this is the fact that the Democratic Party is ruled by their special interest allies. This November, rest assured that voters across the United States will render a verdict on Harry Reid’s Do-Nothing Senate. The 2012 NFL draft is only a day old so I’m only able to give the Vikings a grade based on their picks today. But, oh, what a grade it is. An hour prior to the official start of the draft, ESPN’s Chris Mortenson and Adam Shefter announced that the Vikings had traded the third overall pick to the Browns for the 4th overall pick, plus Cleveland’s 118th, 139th & 211th picks. In short, Spielman convinced the Browns to give him the additional ammunition that hey’ll need to expedite the Vikings’ rebuilding job. It didn’t take long to lear that that was a major thing. With the fourth pick he’d aquired from Cleveland, Spielman got the player he’d wanted all along in USC LT Matt Kalil. After a flurry of trades, the Vikings combined the 35th pick (the third pick in the 2nd round) with the 98th pick (third pick in the 4th round) to trade back into the first round to take Notre Dame safety Harrison Smith with the 29th pick they’d acquired from Baltimore. Friday night, the Vikings will start the night with the 66th pick, which is the third pick in the third round. Saturday, the Vikings will have a fistful of fourth-rounders, 2 fifth-rounders, a sixth-rounder and 2 seventh-rounders. It’s possible the Vikings can package the 66th pick with some third day picks and get back into the 2nd round. That might not be necessary, though, because the talent that dropped into the 2nd round was pretty substantial. It isn’t that the players that dropped fit the Vikings priorities. It’s that some teams made surprising picks that pushed other talented players into the 2nd day of the draft. It’s likely that the Vikings will focus on getting a cornerback & a wideout before adding depth with the rest of the draft. Elsewhere in the NFC North, Chicago drafted OLB Shea McClellin of Boise State, Detroit picking Iowa OT Riley Rieff and Green Bay picking USC DE Nick Perry. It isn’t difficult to make a legitimate case that each of the NFC North teams improved themselves with their picks. Elsewhere in the draft, the Rams got a solid DT in Michael Brockers after trading out of the sixth pick. Though he’ll help their defense, Jeff Fischer has to be disappointed. They’d hoped that they’d draft Oklahoma State wideout Justin Blackmon with sixth pick. When Jacksonville swapped picks with Tampa, they picked Blackmon. That led to the Rams trading back to the 14th pick in a trade with the Cowboys. The Rams hoped they’d still get Michael Floyd with the 14th pick. Instead, the Cardinals used their 13th overall pick to take Floyd to pair him with Larry Fitzgerald. St. Louis should’ve just picked Floyd with the sixth pick, which analysts would’ve said was a little bit of a reach. Still, they would’ve gotten a prime weapon for QB Sam Bradford. Instead, they got a defensive tackle and extra picks that they’ll use to take lesser talents. Right now, I’d give the Vikings, the Patriots and Cincinnati the highest grades from the first day. The Patriots significantly upgraded their defense with passrushing DE Chandler Jones and ILB Dont’a Hightower. Cincinnati upgraded their secondary by picking Alabama CB Dre Kirkpatrick with the 17th pick. Then they upgraded their offensive line by picking OG Kevin Zeitler from Wisconsin. Of the teams with just 1 pick in the first round, Green Bay, Pittsburgh and Buffalo really helped themselves alot. Green Bay got the passrusher they need to take pressure off Clay Matthews when they drafted Nick Perry of USC. Pittsburgh helped themselves immensely in picking Stanford OG David DeCastro. DeCastro is a mauler in the Steelers’ tradition. Buffalo has had a fantastic offseason, first getting DEs Mario Williams and Mark Anderson in free angency, then adding CB Stephon Gilmore of South Carolina with the 10th pick. Buffalo’s defense took a giant step forward, both in terms of upgrading their defensive line and their secondary. Are Democrats rejecting President Obama? “They view everything through their own personal situation and if they can’t afford to do it, they can’t enjoy it, they don’t like Obama using their tax dollars to benefit himself,” said pollster John McLaughlin. “In this case, they see him as out of touch. While they are struggling he’s not sharing in that struggle and he’s basically doing what they can’t do on their tax dollars,” added the GOP pollster. A significant portion of these voters have experienced buyers remorse. In 2008, a high percentage of people had high expectations for President Obama. During the only term he’ll get, he’s managed to steal hope from them, often leaving them struggling from paycheck to paycheck. The only thing worse than having no hope is being optimistic, then having that optimism destroyed. That’s where alot of people are thank to Obamanomics. Michelle Obama shouldn’t be titled the First Lady as much as she should be titled the First Vacationer. She’s lived a lavish lifestyle while others struggled. Ditto with President Obama. If I had a $5 bill each time I heard Democrat spinmeisters defend President Obama after a round of golf, I’d be able to buy a modest golf course. If I had another $5 bill for each time a Democrat spinmeister said something like ‘We should want our president well-rested so he can do his job’, I’d be able to buy several golf courses. I might be the exception but I’m betting I’m not in thinking that presidents should be dogged in their pursuit of solutions. If that means they leave office frazzled at the end of their second term, so be it. This isn’t just any job. POTUS is the leader of the free world, the commander-in-chief and the nation’s chief cheerleader. If someone isn’t willing to do the work that’s expected of him, then he should get fired this November. Based on this information, I’d argue that there’s a better than 50-50 chance that’s what voters are gearing up to do this November. “It seems to me the federal government just doesn’t want to know who’s here illegally,” Chief Justice John G. Roberts Jr. said at one point. This administration is about to get embarrassed by the Supremes again. That’s because this administration thinks it can rewrite the Constitution whenever it wants. This administration got rolled by a 9-0 ruling when it tried telling private property owners they didn’t have the right to contest the EPA’s administrative rulings. I don’t expect a unanimous ruling this time (Justice Kagan recused herself) but I’d be surprised if SB1070 isn’t ruled constitutional with votes to spare. The Holder Justice Department is getting the reputation for being corrupt and inept. Verilli is getting a reputation of ineptly arguing questionable cases before the Supreme Court. That’s what happens when the administration makes foolish decisions, then has the solicitor general defend its foolish decisions in the Supreme court. It’s particularly embarrassing for the solicitor general to be told by Justice Sotomayor that his arguments weren’t playing well with the justices. That’s what happens when an incompetent solicitor general argues for a corrupt administration’s bankrupt policies in front of the Supreme Court. While there’s some doubt about whether the Supreme Court will overturn Obamacare, there’s little doubt that SCOTUS will rule in Arizona’s favor. As a football junkie, the NFL draft is like Christmas in April for me. Aa a reward for the Vikings’ awful season, the Vikings have the third overall pick. At least for the time being. I don’t have special insider knowledge. I haven’t talked to any executives or scouting directors. i just have a hunch that makes tons of sense. I’m betting that Tampa gets enamored with Trent Richardson, Alabama’s supertalented running back. If that’s the case, they’ll need to jump past the Cleveland Browns to get TRich. The Vikings are their only option at that point. To move up, it’ll cost them their third round pick, the 68th pick overall, as well as their fifth rounder. The Viking would likely have their choice of either Morris Claiborne or Matt Kalil with the fifth pick. My preference is Claiborne because the Vikings’ secondary is utterly depleted. That’s terrible news in a division with 3 top gunslinging QBs and receivers like Detroit’s Megatron, Chicago’s Brandon Marshall, Green Bay’s Greg Jennings and Jordy Nelson. The Vikings don’t need a corner. They need 2. With that extra third rounder, they could combine that with the 35th pick to trade back into the 20-24th pick. I don’t know if they’re interested in this but if they were, they could target Dre Kirkpatrick, Alabama’s ubertalented corner. This would clearly be a draft day deal because they’d be targetting a specific player like Kirkpatrick. Taking Kirkpatrick and Claiborne in the first round would be a major coup for the Vikings. By drafting 2 of the top 3 corners in this draft, they’d turn a weakness into a strength for the rest of this decade. That would be a huge step towards competitiveness in this the NFL North. I’d recommend they sign Marcus McNeill to a one year contract to play left tackle. After that, they could pick a wideout with their other third rounder. This isn’t as much a mock draft as a Vikings fan’s wish list. It isn’t that realistic from the mock drafts I’ve read tonight but that doesn’t mean teams don’t throw the other teams a curveball every now and then. For a more professional, well-researched mock draft, check out Scott Wright’s Draft Countdown later this morning for his final mock draft. Did Senate kill Vikings’ stadium bill? But adding racino gambling would cost needed political support, said Sen. Julie Rosen, R-Fairmont, sponsor of the stadium bill in the Senate. She called its addition “a serious blow to the bill.” “It will have to be taken out,” Rosen said. A spokeswoman for Dayton said she couldn’t say whether the DFL governor would sign a stadium bill that included racino gambling. Earlier Wednesday, Dayton said he didn’t think racino should be in the stadium plan. If it’s challenged in court, he said, the sale of construction bonds would have to be postponed until the legal process had concluded. There’s sure to be a powerful lobbying effort from MIGA and CAGE on behalf of getting rid of the Racino provision. That’s as predictable as the sun rising in the east. It’s rare that CAGE and MIGA will fight together, albeit with different motives. More anti-Racino lobbyists will certainly descend on the Capitol Thursday than locusts descended on Egypt just prior to the Exodus. It’s difficult seeing how that provision stays in the Vikings’ legislation through the next committee hearing. Once the Vikings Stadium is built, if that is the outcome, then Racino will be dead in its tracks once and for all. After that, MIGA and the DFL will kill it whenever it’s resurrected. That’s as predictable as betting that the sun will rise in the east.